Take away the drinking, the sadomasochism, the horrific visions, and the fact that one of Britain’s great modern painters is involved, and “Love is the Devil” might be just like any other love story. Boy meets boy, boy falls for boy, boy loses interest in boy, boy has nightmares about sitting perched on the end of the diving board screaming and covered in blood. Okay, maybe not that last bit. John Maybury’s 1998 film, starring Derek Jacobi and a young Daniel Craig, has been re-mastered and re-released on Blu-ray this week by Strand Releasing. Mesmerizing and hallucinogenic, it’s the sort of film that sticks to your skin. 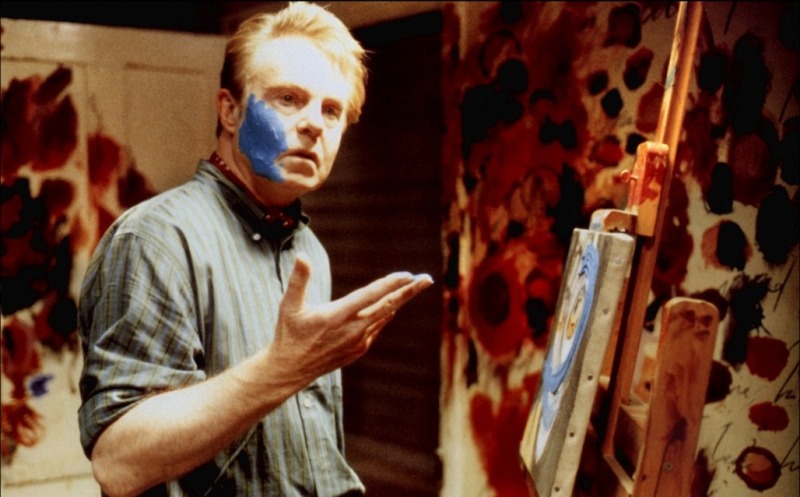 Jacobi plays Francis Bacon, the British painter who painted gory, grotesque works that displayed the body in all its ugly, fragile splendor. Maybury couldn’t get the rights to any of Bacon’s works for the film, so instead watching the film feels like living inside a Bacon painting. Swashes of red and black specks cover the screen, and Maybury is constantly shooting in distorted reflections of bar mirrors and shot glasses, making the characters look like diseased funhouse figures. The perverted exteriors reflect the curdled interiors of the characters. Bacon is a callous and careless man, prone to vicious insults delivered with a fey purr. He is surrounded by other alcoholic artists in 1960s London, all hurling poisoned barbs at each other like rats scrabbling in a cage. Presiding over them all is Muriel Belcher (a grotesquely hypnotic Tilda Swinton, wearing dental prosthetics that make her “Snowpiercer” teeth look like something out of a Gleem commercial by comparison). Into this chamber of horrors literally falls George (Craig), a small-time hood who crashes through the skylight of Bacon’s studio while attempting to rob the place. Unfazed, Bacon promptly invites him to bed. While George dominates in the bedroom, Bacon is in control outside, treating George like a new pet that he grows increasingly bored of. The neurotic George, prone to scrubbing himself clean to the point of drawing blood, becomes desperate as Bacon strings him along, making him suffer humiliation after humiliation. Craig, skinnier and more jittery than the 007 we’re used to seeing these days, is remarkable as George, who hides a fragile emotional state beneath his regular-bloke East End exterior. And Jacobi, who I’m used to seeing in handsome productions like Kenneth Branagh’s “Henry V,” is magnetic as Bacon, a monster who has found an outlet for his sociopathy in his paintings. “Love is the Devil” is a brave and uncompromising film, and kudos to Strand for giving audiences the chances to rediscover it 17 years later.